Last week Mario Draghi, the president of the European Central Bank, declared that his institution “is ready to do whatever it takes to preserve the euro” – and markets celebrated. In particular, interest rates on Spanish bonds fell sharply, and stock markets soared everywhere. Robert Weiner and Richard Mann: Health Decision Dangers: Are the New Deal and Great Society at Risk? When the Supreme Court affirmed the Affordable Health Care Act, liberals were running everywhere expressing love, kisses, and euphoria for the decision. Nobody has been talking about the destructive parts of the Court’s actions. Upholding the expansion of health care is a good decision for the American people, but the Court made a business-based decision. The Court held the bill constitutional where it goes through the insurance companies, but it gives the States the right not to expand Medicaid or create the exchanges for the 30 million people without health insurance – even though states will be hard pressed to refuse the near-full federal funding for the expansion. Most significant, the decision denies the authority of the Commerce Clause, putting the nation’s entire social safety net at risk. A new Republican spending proposal (pdf) revives some of the more extreme attacks on women’s health and freedom that were blocked by the Senate earlier in this Congress. The resurrection is part of an alarming national crusade that goes beyond abortion rights and strikes broadly at women’s health in general. Here are the two great campaign mysteries at midsummer: Why does Mitt Romney appear to be getting so much traction from ripping a few of President Obama’s words out of context? And why aren’t Romney and other Republicans moving to the political center as the election approaches? Both mysteries point to an important fact about the 2012 campaign: For conservatives, this is a go-for-broke election. They and a Republican Party now under their control hope to eke out a narrow victory in November on the basis of a quite radical program that includes more tax cuts for the rich, deep reductions in domestic spending, big increases in military spending, and a sharp rollback in government regulation. Peter Edelman: Poverty in America: Why Can’t We End It? RONALD REAGAN famously said, “We fought a war on poverty and poverty won.” With 46 million Americans – 15 percent of the population – now counted as poor, it’s tempting to think he may have been right. The gloomy annual report of the trustees of Social Security has provoked the usual ominous predictions of big trouble ahead. Media accounts spoke of significant deterioration in the financial outlook of the system, and declared it unsustainable unless structural changes were made. The scare words might seem to justify the often-heard prediction that Social Security may last long enough to sustain our current oldsters, but that it is headed for bankruptcy and “won’t be there” for our younger citizens. Into the future, Social Security can and will provide wage replacement at about the same level it does now. It does not depend for its resources on an entity that might run out of money, that has no way to raise more, and could go into bankruptcy. The U.S. government has the ability to raise enough revenue to pay out whatever level of Social Security benefits the public wants. In that, Social Security resembles all the other things the government pays for, including the national parks, the Food and Drug Administration, and the Department of Defense. This letter was prompted by the government’s response to the Occupy movement. Federal officials have yet to respond to two United Nations human rights envoys who formally requested that the UI.S. government protect Occupy protesters against excessive force by law enforcement officials. The letter to the Obama administration was made public at the UN Human Rights Council meeting. 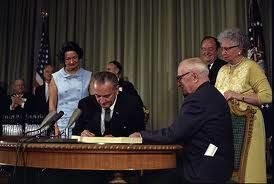 On this day in 1965, President Lyndon B. Johnson signs Medicare, a health insurance program for elderly Americans, into law. At the bill-signing ceremony, which took place at the Truman Library in Independence, Missouri, former President Harry S. Truman was enrolled as Medicare’s first beneficiary and received the first Medicare card. Johnson wanted to recognize Truman, who, in 1945, had become the first president to propose national health insurance, an initiative that was opposed at the time by Congress. This is the complete schedule for today. It covers from 6 am to 6 am. Spain gets bounced from Football. Only the World and European champions. World Champion Wieber does not Qualify in Women’s Gymnastics (Overall). For example, Bob Costas said North Korea’s greatest athletic achievement belongs to “dear leader Kim Jong-Il who, according to his official biography, carded 11 holes-in one, not over a lifetime but over the first round he played. Last time we started talking about the allotropes of carbon, finished graphite and began with diamond. Tonight we shall continue the diamond saga and maybe move to a third common allotrope. Last week I was having some connectivity problems and, quite frankly, was ill with a bad cold, so I just did not feel much like writing. I am better (much) this week and my computer seems to be functioning within design parameters. Since the part that I wrote about diamond was so short last time, I shall paraphrase it as the start of this piece. That way you do not have to hit the link to get up to speed. “The heyday of exurbs may well be behind us,” Yale University economist Robert J. Shiller said. Shiller, co-creator of a Standard & Poor’s housing index, is perhaps best known for identifying the risks of a U.S. housing bubble before it actually burst in 2006-2007. Examining the current market, he believes America is now at a turning point, shifting away from faraway suburbs to cities amid persistently high gasoline prices. 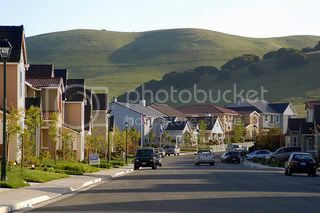 “Suburban housing prices may not recover in our lifetime,” Shiller said, calling the development of suburbs since 1950 “unusual,” enabled only by the rise of the automobile and the nation’s highway system. As it was originally designed, Outer Suburbia and Exurbia was designed to fail in an era where increasing energy efficiency will be a fundamental platform for ongoing growth. However, its possible to retrofit Outer Suburbia and Exurbia to a more sustainable design.